Your child to learn and achieve in school? Peace of mind and to know your child is on track? To know you have done everything you can to help your child? When you bring your child for a speech pathology assessment, it is a win/win situation. We will be able to tell you exactly what stage your child is at and if they are behind or on track. Trying to find the right speech therapist and clinic can be tricky decision to make; and you want it to be the right decision that you make. If your child is on track; then we will more than happy to tell you. If your child needs some help; then we can help them and provide you with ways to help them improve. We believe that every child can learn and we see this everyday. At the end of the day, you know your child better than anyone! If you have concerns, it is better to do something now, rather than later. We are here to help anyway we can. Speak to our friendly team Monday to Friday 9am to 5pm about your child’s needs and what you would like to achieve. Our lovely admin will greet you. They will give you some basic information to fill out about your child. Your speech therapist will greet you and take you into their room. They will get started with your child straight away and chat to you about the paperwork at the end of the session. Please dont be concerned about your child’s behaviour. 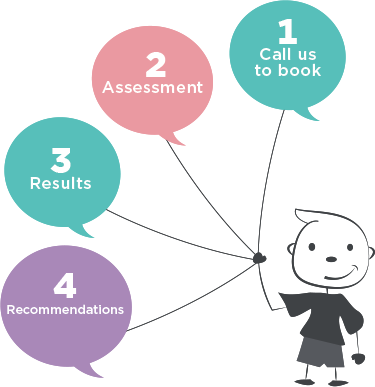 We understand that your child may have difficulties, we don’t judge and it’s our role to help. Your speech therapist will discuss your child’s identified areas of strength and areas for improvement. Regular Speech Therapy – your child has areas that need improvement and we can help Monitor – your childs developement over period of time. No Therapy – your child’s developement is on track.